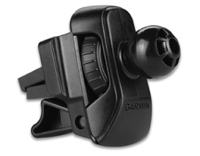 Garmin Air Vent Mount (010-11952-00) | Discount GPS Accessories from mysatnav.ie Ireland's leading GPS & Sat Nav store. This Air Vent Mount is compatible with all nüvis except the 7" models. It easily attaches to the cradle/unit bracket and securely holds your nüvi in place keeping it conveniently within arm's reach.